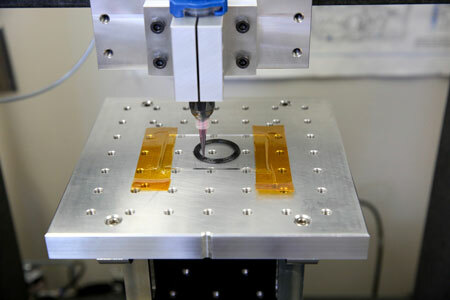 (Nanowerk News) Lawrence Livermore National Lab researchers have become the first to 3D print aerospace-grade carbon fiber composites, opening the door to greater control and optimization of the lightweight, yet stronger than steel material. The research, published by the journal Nature Scientific Reports represents a “significant advance” in the development of micro-extrusion 3D printing techniques for carbon fiber, the authors reported. A carbon fiber composite ink extrudes from a customized direct ink writing (DIW) 3D printer, eventually building part of a rocket nozzle. However, LLNL researchers reported printing several complex 3D structures through a modified Direct Ink Writing (DIW) 3D printing process. Lewicki and his team also developed and patented a new chemistry that can cure the material in seconds instead of hours, and used the Lab’s high-performance computing capabilities to develop accurate models of the flow of carbon fiber filaments. Computational modeling was performed on LLNL’s supercomputers by a team of computational engineers, who needed to simulate thousands of carbon fibers as they emerged from the ink nozzle to find out how to best align them during the process. A computer animation simulates how carbon fibers align and extrude through a 3D printing nozzle. The ability to 3D print offers new degrees of freedom for carbon fiber, researchers said, enabling them to have control over the parts’ mesostructure. The material is also conductive, allowing for directed thermal channeling within a structure. The resultant material, the researchers said, could be used to make high-performance airplane wings, satellite components that are insulated on one side and don’t need to be rotated in space, or wearables that can draw heat from the body but don’t allow it in. The direct ink writing process also makes it possible to print parts with all the carbon fibers going the same direction within the microstructures, allowing them to outperform similar materials created with other methods done with random alignment. Through this process, researchers said they’re able to use two-thirds less carbon fiber and get the same material properties from the finished part. The researchers will next turn their attention to optimizing the process, figuring out the best places to lay down the carbon fiber to maximize performance. There have been discussions with commercial, aerospace and defense partners to move forward on future development of the technology.